So, Doug Jones prevailed against the odds in Alabama. This is a legitimate reason to feel optimistic, but just for a while. The Democratic win in the Deep South came under unusual circumstances and against a spectacularly flawed Republican candidate—it is no reason for the Democratic Party to feel overly confident about its prospects next year. Besides, there are too many other problems out there that challenge our frayed two-party system to warrant celebrating one unexpected swing of the pendulum. 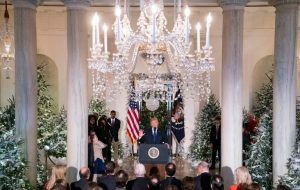 Trump: “A giant tax cut for Christmas.” Photo: Doug Mills/The New York Times. But, it’s the holidays! Enough doom and gloom, at least for the moment. Let’s try to look on the bright side, enjoy what’s good in our individual lives, and hope that some degree of civic sanity can be restored in the coming year.